Everything that deceives may be said to enchant, thus wrote Plato. In the world of arts this idea is almost self-evident: the artist transforms dead materials like wood, marble or paint into his or her perception of the world. The very fact that this version of reality is subjective forms the essence of its attraction to the viewer. There is one genre for which the art of deception forms its essence: the trompe-l’oeil. Here, the artist tries to trick our eye by creating a convincing optical illusion. Early examples of trompe-l’oeils can be found in Greek and Roman art, such as the famous murals in Pompeii, which offer views onto a non-existent landscape. Their popularity took a flight in the Baroque period, where the trompe-loeil’s illusionistic character perfectly suited the theatricality so embedded in this era. This stunning nineteenth-century example of a trompe-l’oeil is by the Catalan artist Pere Borrell del Caso. The relatively unknown Borrell, who lived from 1835 until 1910, was the son of a carpenter. When he went to Barcelona as a young man to get his artistic training at the renowned Escola de la Llotja, he kept on working as a chest maker to pay for his classes. Borrell distanced himself from the Romanticism that dominated the education at the academy. He rejected the idealization and insincerity that, in his eyes, were so typical of Romantic art and chose to change to the novel style of Realism. He founded his own art academy, the Sociedad de Bellas Artes. Here, students were encouraged to work en plein air, a rare phenomenon in those days. 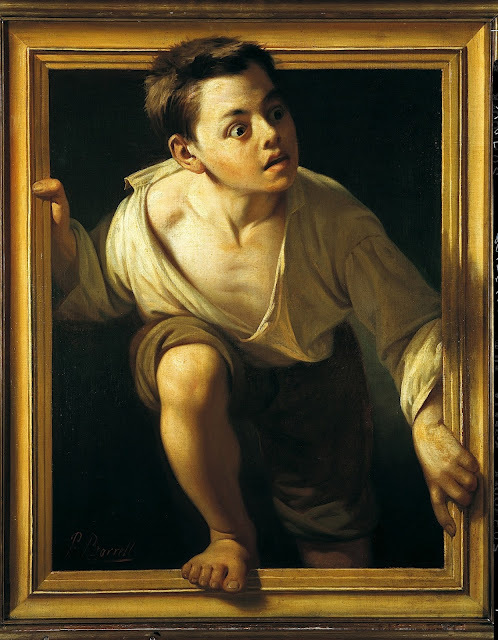 This painting, that shows an ill-clothed boy who clambers out of a picture frame to enter the world outside it, is entitled ‘Fugint de la crítica’ (Escaping criticism). Though its exact meaning or intention are unknown, it is not unlikely that Borrell referred to the conservative art critics of his days, who only wanted to see heroes and ethics, thus ignoring the vitality of the real world.